Craft Snark: Mumble, mumble, misunderstanding. I talk too fast, and too much, and too often. Sometimes I fill dead air with witty banter, and sometimes I fall short of the mark. It isn't my fault that I understand how demanding situations are. Howling at me to fill the void with something. Anything. And when I acquiesce, when I relent to the insistent silence and say something... it is often the wrong thing. Somehow, with a dozen different phrases and facts running through my mind, I sink my teeth into the wrong one. Do you know what happens when you've said absolutely the wrong thing at absolutely the worst time? Silence. An onerous silence that insists on being filled. And when again I comply with the demands of the quiet, what I say is no longer my fault. Regardless of the words I choose, they will be misunderstood. 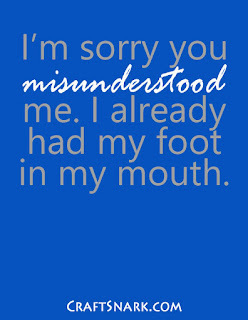 Because I have to say them while speaking around the foot that I already have put in my mouth.